Dr. Drekyll is a good man. He has potential. He has athleticism. He has skills. But he also has a dark side. A wild side. A dangerous side. Examining his secret evil side, Dr. Drekyll decided that he wanted to separate the full court dribbling, through the legs going, behind the back passing evil basketball player from the solid post movin, finesse in the lane'in, slam dunking basketball player everyone loves. 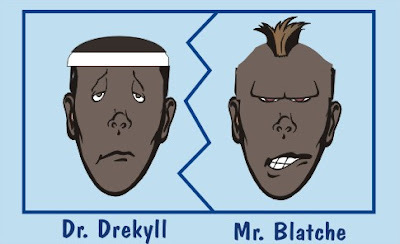 So Drekyll created a headband that, when removed, would transform him into a darker, more out of control creature called Mr. Blatche and separate his evil side from his good side. Mr. Blatche is an abomination of a basketball player. He hacks, he loafs, he whines, he complains. His basketball skills are lacking as he is out of control. He won't listen to teaching or reason, and he has many enemies. He goes to clubs til 6 in the morning, picks up prostitutes, hangs around bad parts of town. Just everything bad about Dr. Drekyll all out in the open.